Following Jordan Kahn's successful debut run at Test Kitchen last week, the pop-up instantly became one of the hottest tickets in town, with hungry Angelenos grabbing up slots even before the participating chefs were announced. 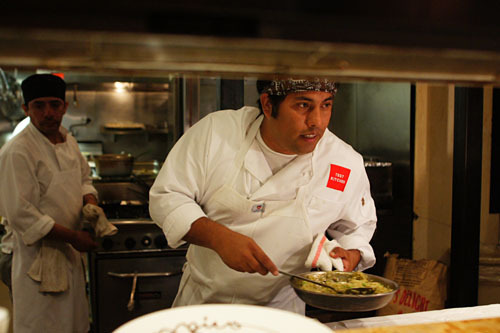 One of the early reveals was for Mo-Chica's Ricardo Zarate, who was scheduled to cook here for one night only. Yesterday, the Chef previewed dishes from his upcoming restaurant, a joint venture with veteran restaurateur Stephane Bombet that will reside at this very address (on the second floor, which is being renovated). For the uninitiated, Test Kitchen, housed at the site of the recently-departed Spark Woodfire Grill, is the brainchild of restaurateur Bill Chait (one of the original owners of Spark) and wife Elizabeth, as well as Boyz Night Out co-founder Brian Saltsburg. Currently scheduled to run for about a month, Test Kitchen aims to serve as a laboratory where chefs can test out dishes for their upcoming restaurants. Following Kahn and Zarate's stints, the kitchen will be turned over to none other than Walter Manzke, who will be previewing dishes from his first, still unnamed restaurant. Rivera's John Sedlar will also be showcasing R26 at a future date, and rumored participants even include Michael Voltaggio and the crew behind Starry Kitchen. Fellow foodie types in attendance this evening included: Abby of Pleasure Palate (with Wasima), Umami Burger mogul and Red Medicine partner Adam Fleischman, Ann "menu taster" N from Yelp, Bricia Lopez of Guelaguetza fame, loyal kevinEats readers Allura and Collier (who'd previously organized dinners at WP24 and Lucques), John Sedlar (cooking here sometime in the future), Nguyen and Thi Tran (the lovable duo behind Starry Kitchen), Steve Samson/Zach Pollack (former chefs at Pizzeria Ortica), Tiffany Lee (winner of the Taste at The Grove recipe contest, helping out in the kitchen), and last but not least, Walter Manzke (who would be cooking here the following day). 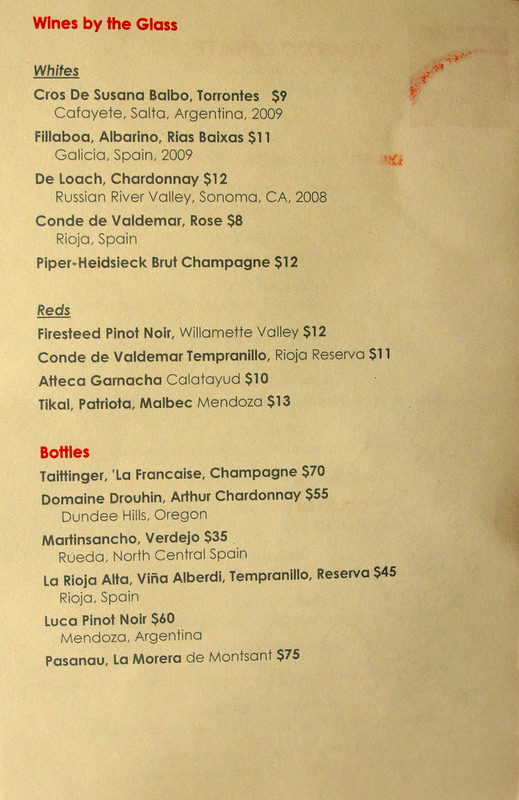 As was the case with Jordan Kahn, Zarate's menu was also priced at a reasonable $40 per person, while cocktails were slightly pricier, checking in at $12. Click for larger versions. The persons previously seated at our table decided to linger, leaving us stranded at the bar. What to do then? A round of drinks, of course (courtesy of Collier). 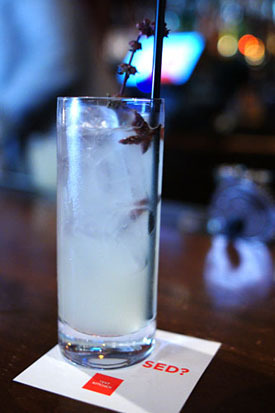 The Malabar (Pisco, Anise, Ginger, Lemon Soda Garnished with Flowers) was the least successful, showing an initial tartness leading to an herbaceous, anise- and ginger-laced finish. 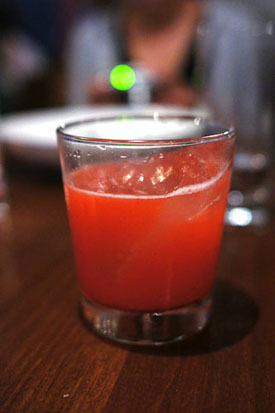 My favorite was the Pisco Punch (Pisco, Lemon, Homemade Grenadine, Apple Butter, Don's Mix); I loved its interplay between the pisco and lemon, and how the finish was imbued with fantastically buttery, apple-tinged flavors--superb. 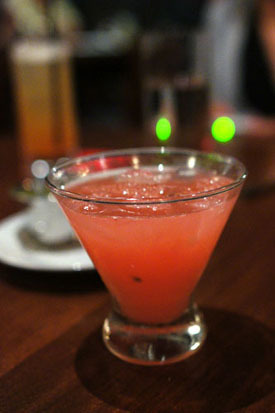 We also enjoyed the Guns and Lavender (Pisco, Watermelon, Lavender and Bitters, Lime, Indonesian Long Corn), thoroughly relishing its cool watermelon flavors tempered by the astringency of lavender. 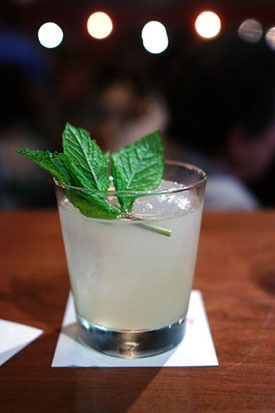 For the Bespoke Cocktail, Collier specified something South American-inspired, but with vodka; the result was a sweet and sour libation, balanced by zesty notes of mint; quite nice! 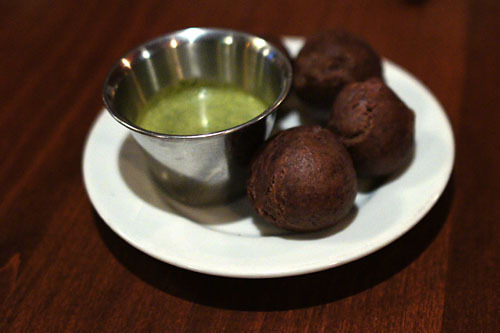 After a near 45-minute wait, we were led to our tables and subsequently presented with plate of purple cornbread balls. Strangely satisfying, they demonstrated earthy, complex flavors of corn, and went beautifully with their nutty, subtly spicy sauce. Parihuela can be likened to a Peruvian bouillabaisse, typically containing onion, tomato, garlic, pisco (a grape brandy), and aji pepper. 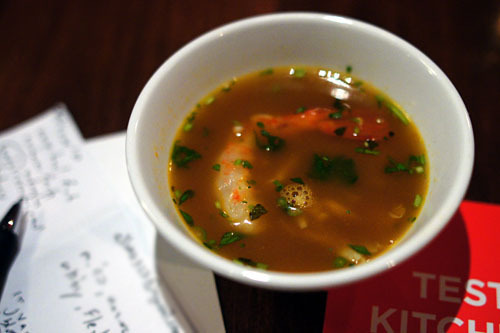 I loved the broth's heady, unabashedly ocean-y aroma, balanced by a bit of vegetal bouquet. Tasting the soup, I noted its briny, deep, flavors--with a hint of corn--heightened by the natural sweetness of the Dungeness crab. I also quite appreciated the shrimp, which was cooked to a perfect, delicate, creamy consistency, succinctly conveying the quintessence of the crustacean. 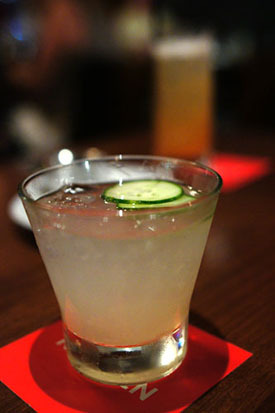 For our second round of cocktails, we ordered up more of our favorites, the Pisco Punch and Guns and Lavender, while I also requested a custom cocktail, something "savory" made with gin. What I got showed off flavors of cucumber and lime, with a tart character intertwined with savory, herbaceous notes--not bad at all! 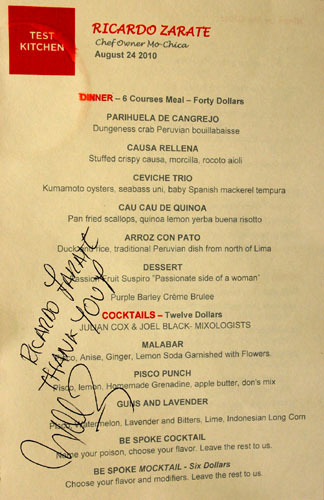 Ceviche, a dish of citrus-marinated seafood, is perhaps one of Peru's most famous culinary exports, and tonight, Zarate served up his own interpretation of the ubiquitous dish. I began with the Kumamoto, which had a delightfully savory-sweet flavor, balanced beautifully by the application of seaweed and pepper--my favorite of the trio. Next, seabass and uni made for an interesting combination, with the sugariness of urchin giving way to the growing brine of the bass; a fascinating ceviche, though perhaps it could've used a bit more acidity. Finally, we had a tempura'd mackerel, which didn't seem like a ceviche at all to me. Nevertheless, it did have a pleasing fishiness to it, which was nicely moderated by the aji amarillo pepper aioli. 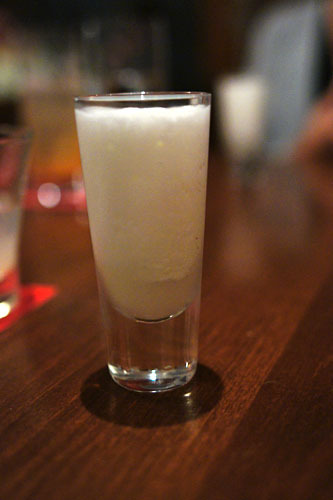 At this point, we were given a "gift from the Chef," basically a Pisco Sour in a shot glass. 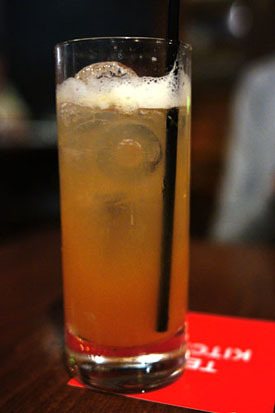 I loved the tangy attack of lime, and how it played with the creamy, egg-y remainder of the drink. 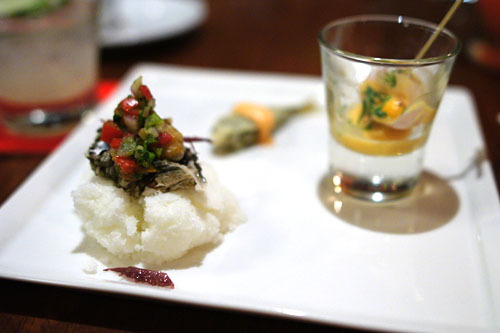 Causas are oft described as a sort of Peruvian potato salad: a cylinder of molded, mashed yellow potato (papa amarilla) mixed with lime and aji, then stuffed with a variety of ingredients (tuna, chicken, shellfish), and finally served with hard boiled eggs and olives. 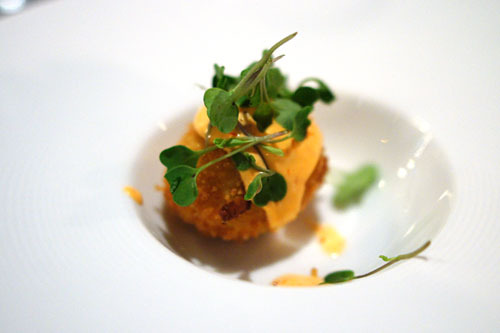 Here, Zarate mixes things up with his crispy version, which reminded me somewhat of a potato croquette. The potato alone was already quite delectable, but I absolutely adored the weight and depth added by the morcilla (blood sausage). Meanwhile, the rocoto (chili pepper) aioli contributed a fantastic heat to the dish that only seemed to increase with mastication, while the greens added a touch of levity to the fray. I could've eaten a dozen of these! Traditionally, cau cau is a cow trip stew, typically cooked with potatoes, garlic, onion, turmeric, aji amarillo, cilantro, and parsley, then served with rice. Zarate, however, chose to replace rice with quinoa, and tripe with scallop, all while adding chicken stock, mint, and crème fraiche into the mix--the end result was stupendous. Indeed, the scallop itself was perfectly cooked, but the key here really was that quinoa. Imbued with a lemon-y tang and the pungent aroma of yerba buena-mint, along with a bit of heat, the risotto perfectly complemented the inherent sweet brine of the mollusk, leading to a beautifully integrated dish. 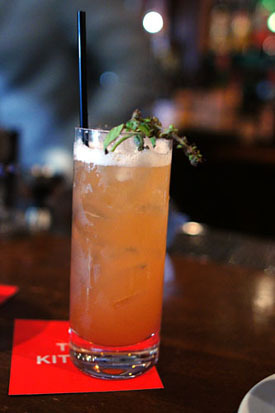 Our final cocktail was another custom creation by resident mixologist Julian Cox. 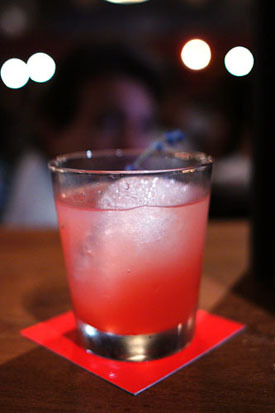 Collier wanted something sugary with pisco, so Cox "went off on it," creating something with a marked pisco attack, but which had a delightful tart-sweetness on the midpalate. Very nice--I liked how this was sweet, but not cloyingly so. 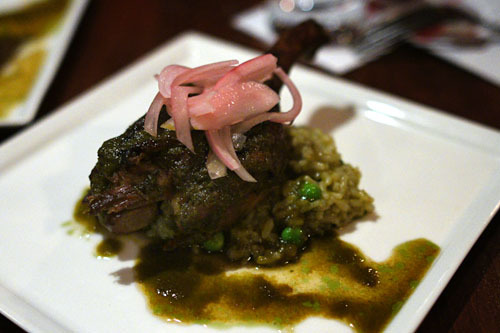 We've all heard of the ubiquitous "arroz con pollo," but Zarate delivers duck with his arroz con pato a la Chiclayana. A dish popular in the northern coastal city of Chiclayo, this was a delectable dish of tender confit duck, cooked in black beer, cilantro, garlic, and aji amarillo. My favorite dish of the night, I loved the duck's supple, falling-apart tender flesh, as well as its rich, earthy, duck-y relish, paired with the bird's smoky, crunchy skin and perked up by the cilantro. Profound and immensely satisfying in flavor, the duck was tempered by the relative mildness of the arroz, with the peas especially providing a lightening effect to the dish. 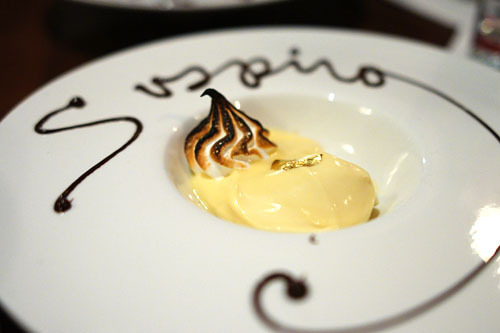 Getting back to the desserts at hand, Pressman first served up a suspiro, basically a passion fruit pudding. The custard was a bit tart for me, though this was moderated somewhat by the application of chocolate, as well as the included meringue. 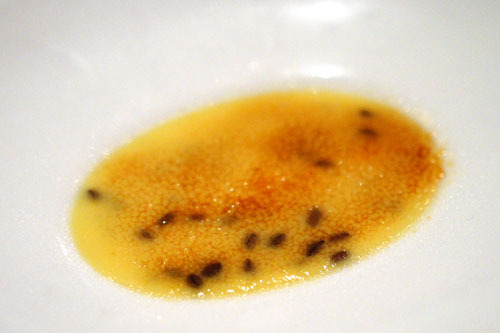 I preferred Pressman's second effort, a crème brulee tarted up with purple barley and more passion fruit. The barley added an almost "rice-y" tinge to the simple sweetness of the créme, while the passion fruit's unabashed sweetness served as a strong counterpoint--very good. Given that Zarate was supposed to test out dishes from his new restaurant Anticucho, I was a bit disappointed initially that there was nary an anticucho in sight. However, the consistent strength of his dishes more than made up for this oversight. Zarate managed to serve up the most sophisticated, refined, and complex Peruvian that I've ever managed to taste. Flavors were bold and articulate, firmly focused and strikingly effective, leaving me, and my dining companions, thoroughly impressed. you came through as expected! you're right..probably would have been better with anticucho...because something refined and delicious like this meal could still be had at his monthly tasting menus at Mo Chica, like today, for less.. Thanks for the shout out! While we have many mutual friends (including one of your dining companions), I don't think we officially met. Was looking forward to meeting last night but things got too crowded - next time! Once again, spot on review. I loved the quinoa as well! My goodness, don't you ever sleep? I can't believe you got your post up so quickly. As always, your pictures are gorgeous. 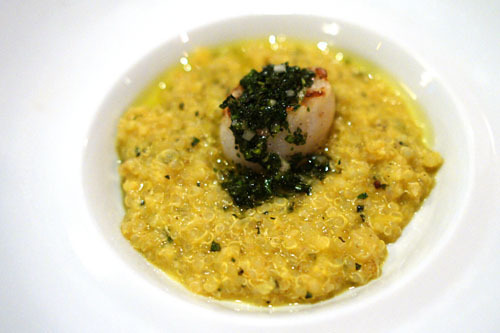 I was there too ;) I enjoyed it, especially loved the scallop/quinoa and causa. My favs/stand outs were: Pisco Punch cocktail, Dungeness crab Peruvian bouillabaisse, Arroz con Pato (Duck and rice), Cau cau de Quinoa (Pan fried scallops w/quinoa) and Purple barley crème brulee. Peruvian food is good! I'm adding Mo-Chica and others to my to eat list. RC: He's actually doing anticuchos on the 2nd and 3rd, if you're interested in that (I won't be able to make those nights). Mo-Chica's only a bit less, at $35 though right? Wasima: I'm sure we'll run into each other again. The foodie world in LA is a small one! FF: Yep, those were some of my favorites as well! Amy: Lol. Have you made any reservations for TK yet? 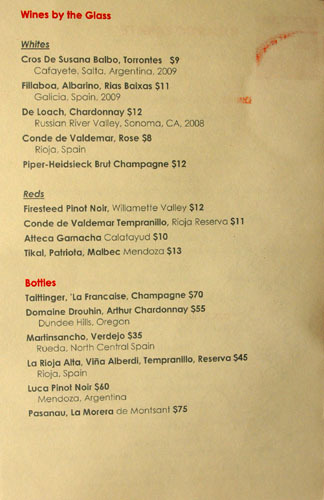 Ann: Definitely check Mo-Chica out, preferably for one of their tasting menus.